Product Consists: Hersheys Syrup Bottle (Weight: 200 Gms), Hersheys Spreads Jar (Weight: 300 Gms), Hersheys Creamy Milk Chocolate Bar (Weight: 40 Gms), Hersheys Cookies n Cream Chocolate Bar (Weight: 40 Gms) along with Designer Rakhi. 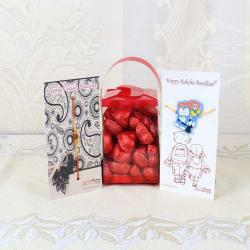 Rakhi symbolizes the spirit of friendship and the pure natural relationship between siblings. Send traditionally designed Rakhi thread with delicious chocolate treat which melts in your brothers mouth and soothe the mind with twinkling memorable moments. 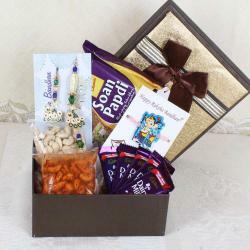 Celebrate the beautiful bond of love which you have share with your adorable brother through Giftacrossindia.com in a unique way with this chocolate gift hamper. 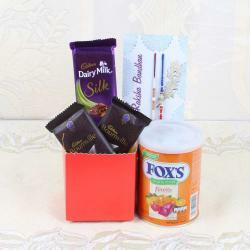 All age brother are allured and fascinated on chocolates which has been bestowed on them as a valuable gift. So no one can resist this devouring of a mouth watering delicious chocolate. 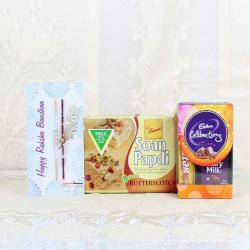 Shop Online Rakhi with Chocolates now and pamper your brother with this combo make him feel special on this Raksha Bandhan. 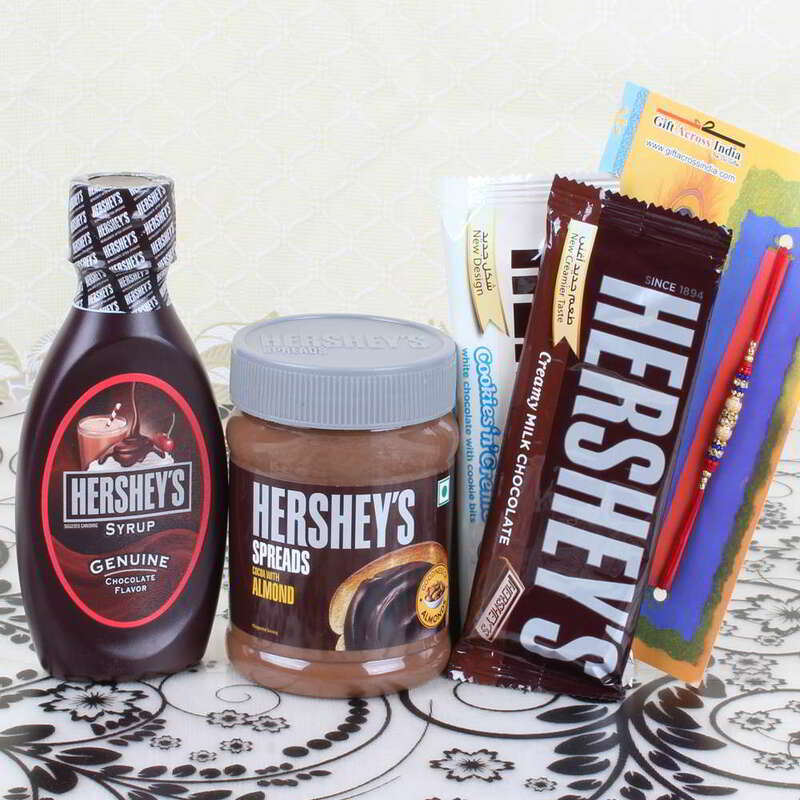 Product Includes: Hersheys Syrup Bottle (Weight: 200 Gms), Hersheys Spreads Jar (Weight: 300 Gms), Hersheys Creamy Milk Chocolate Bar (Weight: 40 Gms), Hersheys Cookies n Cream Chocolate Bar (Weight: 40 Gms) along with Designer Rakhi.